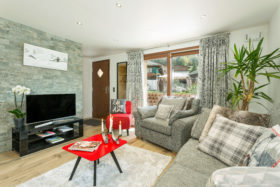 Apartment Paradis is our luxurious two bed-roomed apartment in the heart of Morzine. Just under 5 minutes walk from the town hall, supermarkets, bars, restaurants (just 10 minutes walk from the indoor swimming pool with sauna, steam room) our gorgeous new property is tucked away from the main road ensuring no traffic noise and peace and quiet. The huge outdoor terrace is a great place to sit and have breakfast, or watch the kids play while you enjoy a cold beverage in the summer sun! The apartment has 2 gorgeous bedrooms that can comfortably sleep 4 Adults or a family as the beds can be either configured as twins or Kings. 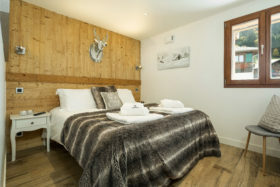 Each bedroom has its own television with English TV, to enjoy a well deserved lie-in or to help settle the kids at night. The bathroom is very modern, with a full size sunk-in bath and full overhead shower and a separate toilet. 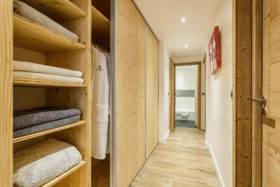 The corridor has an immense cupboard for storage, both hanging space and shelves and is equipped with a washing machine and dryer. 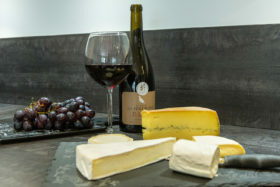 The open plan lounge/diner has a fully equipped kitchen with oven, combi microwave, large fridge/freezer, dishwasher, Nespresso coffee machine and Nutri Bullet. The lounge has two very comfortable sofa’s from which to appreciate the large flat screen television with English TV. The entrance hall has plenty of hooks and boot storage space and outside is a secure ski locker. Everything to make your stay as comfortable as ever!